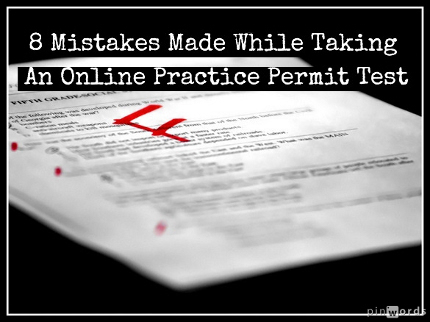 8 Mistakes Made While Taking An Online Practice Permit Test! Studying sample questions from a practice permit test is a great way to brush up on the traffic rules and road signs, there is no denying it. In fact, if there was one single most helpful permit test study aid we had to pick - the free permit practice test would be the one! However, just like any other study resources, practice permit test has its limitations that you need to be aware of to be able to get the most out of it. We went ahead and put together a list of 8 mistakes you can make while taking a practice permit test that will not allow you to get your time's worth! We said it before and we will keep on repeating you until you give up and listen: you have to read the drivers manual before you start doing any sample questions! Your state made a great effort to prepare a publication that will be as concise as possible, yet list everything you need to be able to pass your permit test: it has all requirements for a learners permit, a list of paperwork you need to bring, a list of DMV locations you can go to and all driving rules and road signs you need to know to succeed! There is simply no reason for you not to read the book, the knowledge test at the DMV is based largely on the information in the manual! Taking a practice permit test before you read the handbook is simply pointless, since you will be trying to guess half of the answers. Sure, you can answer 5 or 6 questions out of 10 simply because they are common sense and you watch your parents drive every day, so you already picked up some of the rules, but you will not learn state speed limits, fines, blood alcohol content levels by taking sample questions, you must read the book! Do so before you start working on your free permit practice test! Do you see what's wrong with beginning to study the night before the test? How well did you do on school exams last time you did this? Why do you think it will be different for the learner's permit test? You have to start preparing for the permit test at least a few weeks in advance so you have time to read the book and take as many online practice permit tests as you can. You can definitely take a practice test or two the night before the test to boost your confidence and morale, but you do this only if you have been studying for a while, not as means to prepare for the exam! Start studying early! This is a very common mistake made by about 90% of all people who take a permit practice test online. When people take the test and fail a question or two, they do not work on wrong answers, they just skip right through to the next sample test. If you go through the exam this way, you are unlikely to learn. You must write out the questions you miss and look up the answers to these questions in the official drivers handbook. This will serve two purposes: you will be reading the handbook, which is always good as you are likely to pick up a lot of additional information from it, and you will also be cross checking the test itself. Who is to say that the driving instructor who was writing those questions did not make a mistake? It can be a simple typo, but your driving permit test score depends on it, so you have to make sure that the test is right. Cross checking the answers in the book does that! Most people take a learners permit practice test and stop if they get a score of 80% or above. Why bother, they say, if this score is sufficient to pass the real permit test? I will do just as well on the real test, they say, and stop studying altogether. This is the mistake that can potentially cost you your learners permit. A typical permit practice test has 10-20 questions, while the DMV may choose to select questions from a much larger pool and you will simply not get the same questions you got during your practice exam. The score you get on one practice test cannot truly show you how well you know the rules and how prepared you are for the real test. Take at least 5-6 practice tests and see what your average score is. Don't forget to work on those questions you miss! This mistake is very similar to the one above: people taking a single type of a practice test. There are many different practice tests available: there is a road signs practice test, traffic rules practice test, a practice test that covers fines and penalties, a practice permit test for beginners and for those who already know their way around the state vehicle code. No one says you should only do a single test, try to cover as many of them as you can. Do the regular practice test, then do the DMV practice test, then switch to the drivers license practice test. Cover as many questions as possible, it may seem like hard work now, but it will pay off at the DMV! This is not really a real mistake, but we really don't see why you would want to waste money on sample questions if you can easily find a free practice permit test that is just as good and frequently even better than the paid one. If you feel generous and would like to spend the money you were planning to spend on practice tests anyway, find charity and donate it to them! Don't pay for practice tests until you went through all free sample questions and you find that you are still not satisfied! In most cases, this is not a major problem since most of the driving rules are the same across all states, however if you are looking at a permit practice test that covers fines and penalties or speed limits, you need to make sure you are dealing with a state-specific practice exam. These regulations differ between states (in fact, they may even differ between counties, but you would be hard-pressed to find a sample exam that covers county-specific questions) and you have to make sure you have the correct set of questions to study with. Always make sure your DMV practice test is state specific! These are just 7 common mistakes people make when taking a permit practice test online, make sure you do not make them yourself! If you want to add something to this list, please comment on the article!